← What Makes a Great Ad? Trash and recycling are important topics, but not always easily addressed by companies and individuals. Let’s admit it – trash just isn’t attractive or high on priority lists for most people. But what would happen if we could turn some of our trash, such as plastic bottle, into fun and useful items? 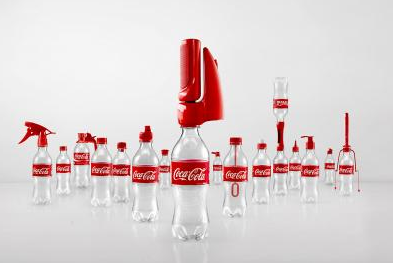 Coca-Cola is doing this very thing in Vietnam with a campaign called “2ndLives,” a 16-cap system of unusual bottle caps that can turn empty plastic bottles into new objects such as lamps, toys, paintbrushes, squirt guns, and more. The beverage industry has long faced attacks over the issue of plastic bottles. Campaigns such as this one can help encourage the reuse of packaging. Other examples are Pringles with an app that encouraged people to reuse chip cans as music amplifiers, and Domino’s Pizza with pizza boxes reused as jack-o’-lanterns. What can you think of for a similar campaign? Poll students: What are common products that have discarded materials (similar to soda and pizza containers)? What are the challenges for these products? What would be the benefit of reuse? Divide students into teams. Assign each team one of the products and have them develop campaigns for reuse/repurpose. Debrief by having each team present its product and campaign. Vote on the winning idea.